Bamber Bridge suffered LFA Challenge Trophy heartbreak as they were beaten 2-1 by Colne in the semi-final at the County Ground, in Leyland. 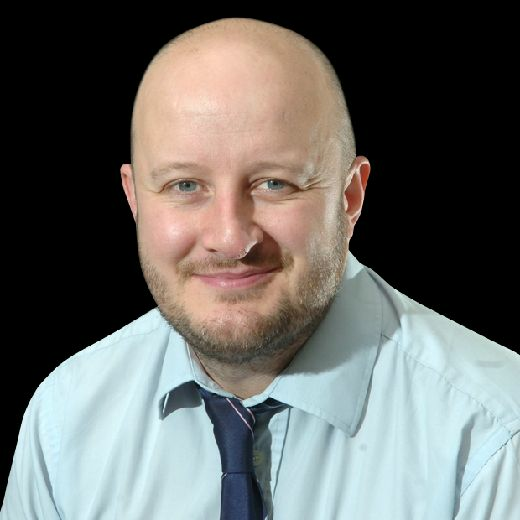 Brig’s dreams of another trip to Bolton Wanderers’ University of Bolton Stadium were ended by substitute Lee Pugh, who struck the winning goal in the 75th minute goal. His effort came just three minutes after Alistair Waddecar had equalised for Brig from the penalty spot after Scott Harries has been upended inside the penalty area. That goal cancelled out Bradley Lynch’s deflected goal in the 36th minute of the first half. Brig can have few complaints about the final result as their NPL West Division opponents over the 90 minutes fully deserved to take their place in the final where they will play either Southport or Ashton Athletic. 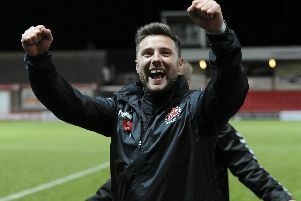 Lynch had the first effort on goal for the Reds when he smartly outfoxed Christopher Churchman but fired his shot across the face of goal in the 12th minute. Matthew Makinson then should have put Colne in front 10 minutes later but he headed Waqaz Azam’s centre wide from point blank range. 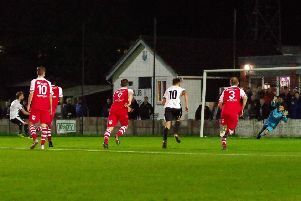 At the other end, Waddecar failed to connect at the far post after Matt Lawlor’s looping header on the half-hour mark. Six minutes later, Colne took the lead when Lynch’s shot from the left-hand side of the box deflected off Churchman wrong-footing Danny Roccia in the Brig goal. In the final few minutes of the half, Matt Dudley struck a free-kick straight at Hakan Burton in the Reds’ goal. And Waddecar went even close on the stroke of half-time, but his wicked 25-yard set-piece sailed the wrong side of the post. The Brig talisman looked set to equalise 10 minutes after the break when he cut inside from the right but his left foot shot cleared the crossbar. Seven minutes later, Pugh fired across goal after being released by a quick-thinking free kick by Bradley Knox. With 20 minutes to go, Brig looked to have been handed a lifeline when a mix-up in the Colne defence resulted in Harries being tripped by Azam inside the area. Waddecar sent the keeper the wrong way from the spot. However, Colne came roaring back just minutes later. Roccia made a brilliant save to deny Josh Hine, but from the resulting corner Pugh fired home from inside the area in the 75th minute. Brig desperately tried to find an equaliser – the nearest they came was when Danny Forbes headed straight at Burton in the fifth minute of stoppage time.